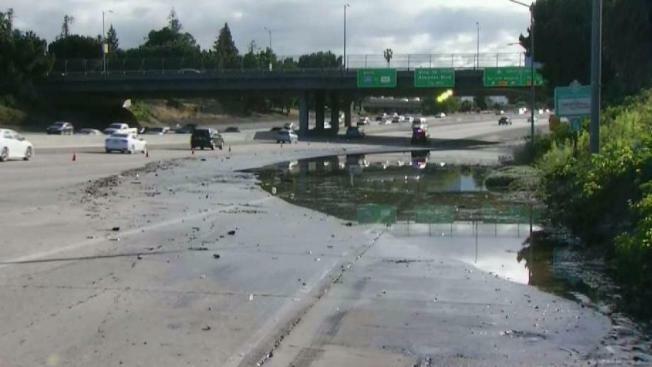 Flooding prompted the closure of all but one lane of southbound Interstate 280 as well as the connector to Highway 87 in San Jose Wednesday morning, according to the California Highway Patrol and Caltrans. Caltrans said the floodwater was actually groundwater that had pooled on the roadway because pumps designed to remove the water were not working properly. Crews were able to eventually drain the water, but the makeshift lake on the busy interstate snarled southbound traffic during the morning commute as motorists crawled by in the fast lane. Caltrans tweeted at 9:21 a.m. that two lanes next to the fast lane of southbound Interstate 280 had reopened. Roughly three hours later, Caltrans tweeted that the far right lane of the interstate and the connector to Highway 87 were back open. Multiple lanes of southbound Interstate 280 and the Highway 87 connector in San Jose were closed Wednesday morning due to flooding. Caltrans workers could be seen brushing away soggy debris that littered the freeway while the water slowly receded.